I know many of you doesn’t know me…….as I tried to add many popular couples in this os….. Couples in this OS are…. Also anupriya from tujhse hai raabta and kiara and angor….. I hope you will like it…. Shine shine falls on our cutie pie’s face……mehak alowly opens her eyes…..she looks damn cute…..she wakes up and sits on the bed.rolling her eyes….then she looks here and there.but doesn’t finds shaurya……..her eyes searches for shaurya…..when she notices a note kept on side table…….she picks it up…..
mehak pouts reading it.which makes her more adorable…..
mehak-did he forget today’s date……may be has lots of work pressure……. Mehak gets ready in her track and trouser………….looking hot……..and makes a high pony and leaves for boxing practice……..
Mehak gets sad thinking that shaurya didn’t even contact her….since today was a special day…..
mehak returns to home …she was still in her boxing dress….. Suddenly lights are switched on…..
Mehak looks around the khanna mansion……whole khanna mansion was decorated beautifully…with her pictures….balloons shaurya and hers pictures…….lights candles…..a big smile crept on her face…..
Anika and sanchi comes their wearing pink and blue gown…..both looking damn beautiful………. From behind…….shivay and kabir also comes and joins anika and sanchi……. Shivika and kanchi together sings- HAPPY BIRTHDAY TO YOU……HAPPY BIRTHDAY TO YOU….. HAPPY BIRTHDAY TO DEAR MEHAK……HAPPY BIRTHDAY TO YOU……. HAPPY BIRTHDAY TO YOU……HAPPY BIRTHDAY TO YOU….. HAPPY BIRTHDAY TO DEAR MEHAK……HAPPY BIRTHDAY TO YOU……. Mehak gets super duper happy……. All comes to mehak who was smiling happily seeing all her buddies together…..and was standing in the centre…looking at everyone……. From back a voice is heard…..
Voice-hey mehaku we are also there…..
Its zoya –aditya and bela-mahir……mehak runs to them and hugs zoya and bela…..then mahir and aditya……..
Bela-hey…don’t thank us…..we are just guests…..
Zoya-yeah yeah……all this credit goes to you hubby……. Anika-yes your hubby shaurya only called us….and planned all this……..
Suraj-wait wait…….we all boys also helped him……. Abhi-yes so credit goes to us also……..
Vivaan- haa.so what……we are worthy of it……. Sanchi-guys…..stop fighting……..by the way where is him…….. They all hears soft music…….all turns around……and sees shaurya standing on stairs holding a guitar….he is looking damn handsome in navy blue tuxedo…….shaurya comes down singing……. Main Doon Na Jaun Kahin..
Waapas Kinaare Pe Aane ..
Main Kisise Kahunga Nahi …. Shaurya comes downstairs…..mehak blushes prerna and kalyani…..pushes mehak towards shaurya…..mehak blushes hard……shaurya sings and moves around mehak…..
Shaurya puts the guitar at a side……and comes towards mehak and holds her hand……..
Mujhe Neend Aati Nahi Hai… Akele Khwabon Me Aaya Karo…. Nahi Chal Sakunga Tumhare Bina…. Main Mera Tum Sahara Bano …. Ek Tumhe Chahne Ke Alawa …Aur Kuch Hum Se Hoga Nahi…. Mai Kisis E Kahunga Nahi…. Soon vihal and mohal…..also joins others couples……. Rooh Se Chahne Wale Aashiq Baat Jismon Ki Karte Nahi…. Main Kisise Kahunga Nahi …Main Kisise Kahunga Nahi…. At end shaurya knells down infront of mehak….holding her hands…….mehak blushes hard……. Shaurya-don’t make such a face….or I have to kiss you infront of everyone AGAIN…..like I kissed you before too infront of everyone……..
Mehak glares shaurya….and shaurya laughs seeing her……. Ragini-ohk.enough of your romance jiju…..mehak come we will get you ready……..
Downwards anika and pragya arrages the things…….other side……meera and chakor…are managing the kitchen…….and guiding servants…. Prerna-mehak di you are looinng damn hot and beautiful……. Sanchi-yeah jiju will go flat seeing you today……. Ragini-ohho……this red cheeks suits you……. Sanchi-ohk ohk……lets go down….someone is waiting for mehak ……. Trio girls takes mehak downstairs….everyone looks at mehak who was looking damn hot and beautiful……….shaurya gets mesmerized seeing her…shaurya comes to mehak and forwards his hand…………and mehak blushingly puts her hand on shaurya’s hand…..shaurya and mehak comes down holding each others hand……..and everyone claps for them……..
All the boys pulls the ropes hanging near the poles…….rose petals falls on mehak and shaurya…..mehak looks around……and gets happy……shaurya looks at smiling mehak……and asks her to cut the cake……. Mehak gives a bite to shaurya…..and shaurya also feeds mehak…shaurya takes the cream and smears it over mehak’s nose….mehak pout…..and everyone laughs seeing their antics……them mehak feeds her parents and chacha chachi……then others…. Soon all of them settle down in the hall……. Aditya-yes so there is a special girft from us to our birthday girl……mehaku…….. Lights are switched off…meharya are sitting holding each other’s hand…..spotlight falls on stage……. kalyani comes their wearing simple pink salwar suit…..while from otherside atharva comes wearing black tuxedo……they both collides.and starts figting…….. In back ground- tere mere darmiyaan song is played……. Meera and vivan comes……….vivan asks sorry for his behavior…and meera forgives………..and their happy love story begins….. The scene shift to ….wedding mandap…..
Where pragya is shown crying in wedding dress……later its shown……….abhi betraying pragya. Bela comes to stay at mahir’s house…..mahir continuously insults her…….later bela leaves mahir……and mahir realize his love……. Zoya is see tortured by goons……and aditya saves her….but zoya comes in between to save aditya and gets stabbed ……. 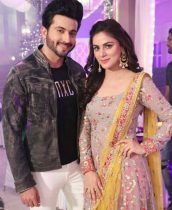 Later aditya is shown crying for zoya…..
Where suraj proposes chakor in front of taj mahal…..
Prerna and anurag…….are marrying each other…..they are happy…. The scene shift to ……. Anika and shivay are thrown out of the house……and they leaves the khanna mansion hand in hands……..
Ragini is shown on different attire…sanskar is trying to remember her their love…….but ragini doesn’t remember anything……..
Later ragini is shown …regaining her memory……and ragsan unites……. Karan and preeta…….saves the city from terrorist attack…. Meera and vivan are killed by vivaan’s mami…………and they die hand in hands……..
Kalyani and atharava……are boxers …..and fighter with each other in ring……. Later they remember their past birth and reunites………..
At last on screnn meharya’s pictures are shown……with written in bold letters ‘’ MEHARYA-A MAGICAL LOVE STORY’’………. Mehak gets teary eyes…….and hugs shaurya………. Mehak-thank you everyone for such a lovely gift……..
Swara-yes mehak di…….it was all idea of shaurya jiju……..
After he guests leaves……all the couples were still their…..
Karan-hey guys lets play something…..and make mehak bhabhi’s birthday memorable………. Athava- yeah…..and for sure we will win……..
All the girls glares boys……..
Kabir- yup we will see………. Mehak was sitting In between the girls……..and shaurya in between the boys………. Prerna –ohk you boys start…lets start with our rockstar abhishek mehra……. Abhi starts singing looking at pragya…..
Churaya hai maine ….Kismat ki lakeeron se..
Teri mohabbat se saansein mili hain …. Sada rehna dil mein kareeb hoke …. Mile ho tum humko ….Bade naseebon se …. Churaya hai maine Kismat ki lakeeron se…..
Kya Yeh Zindgani Hai ….Bas Teri Kahani Hai…. Bas Teri Kahani Hai ….Ye Jo Zindgani Hai…. Kabir sings…looking at sanchi……sanchi blushes hard…. girls starts hooting for sanchi and asks her to sing…..
Agar tum saath ho… Agar tum saath ho…. O karam khudaya hai…. Tujhe mujhse milaya hai …. Tujhpe marke hi toh…. Mujhe jeena aaya hai…. O tere sang yaara ….Khushrang bahara…. Main tera ho jaun…. Jo tu karde ishara…..
Pal.. do pal.. ki hi kyun hai zindagi…..
Rehna hai bas yahan …Ab door tujh se jana nahin…. Jo tu mera hamdard hai…. Jo tu mera hamdard hai Suhana har dard hai.. Jo tu mera humdard hai…. Mahir and aditya stands up…and comes to bela and zoya together and starts singing……. Le jaaye jaane kahan Hawayein hawayein….. Le jaaye tujhe kahan Hawayein hawayein.. Begani hai yeh daali Hawayein hawaye.. Le jaye tujhe kahan Hawayein hawaye.. Le jaaye na jaane kahan Na mujhko khabar na tujhko pata O ho.. Oo hawaye…. Ooh, ranjha ranjha na kar heere…… jag badnami hoye…. Ranjha, ranjha kardi ve main… aape ranjha hoyi …. Ranjha, ranjha saddo ni mainu heer na aakho koyi..
Ooh, ranjha ranjha na kar heere …..jag badnami hoye…. Patti patti jhar jaave par khushboo chup na hoye…. Atharva pulls kalyani and anurag pulls prerna…..and they start dancing…..
Main ta rehna sohniye ..Tere naal naal ni …. Vivan and suraj holds meera and chokor’s hand and starts dancing…. Meri hoke hamesha hi …rehna Kabhi na kehna alvida…. Meri duaon se aati hai… bas yeh sada …. Meri hoke hamesha hi rehna Kabhi na kehna alvida..
Atharva –kalyani,ragini –sanskar,swara-laksha and prerna- anurag join them…. Nashe si chadh gayi oye…. Kudi nashe si chadh gayi…. Patang si lad gayi oye…. Kudi patang si lad gayi…. 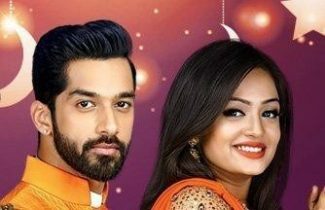 Everyone hoots…..mehak is sitting and enjoying ….and claps for them……and hoots for them…like a baby girl….shaurya looks at her from far…and smiles…. Tenu intna main pyar kara…ek pal wich sau bar kara…. Tu jaave je mainu chhad ke…. Maut da intezaar karaan…. Ke tere liye duniya chod di hai …Tujhpe hi sans aake ruche…. Main tujhko kitna chahta hoon …Ye tu kabhi soch na sake…. Kuch bhi nahi hai ye jahan ….Tu hai to hai ismein zindagi…. Ab mujhko jaana hai kahan… Ke tu hi safar hai aakhiri…. Shaurya caresses mehak’s face mehak looks down…. Neendon mein meri bas tere… khwabon ne li hai karwatein…. Mehak turns and runs to shaurya and hugs him…shaurya reciprocates…. Tere liye duniya chod di hai…. Ye tu kabhi soch na sake….. So finally I ended it I hope I didn’t disrespects any couples……as said this was specialy for my jaan samiksha jaswal.aka mehak’s birthday……but I am late to post it…….. I hope I didn’t hurt anyone’s feelings…..